Desertification is one of the biggest threats associated with Climate Change. 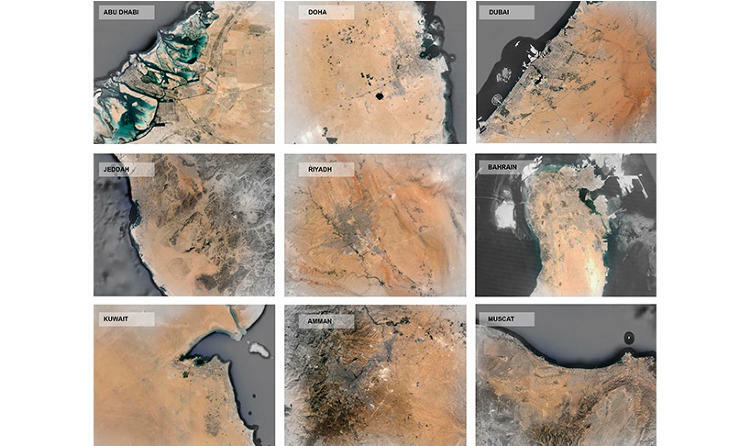 In places like North Africa and the Middle East, where countries already import up to 90% of their food, the spread of the desert due to increasing temperatures and diminished rainfall is made worse by the fact that cities in the region continue to grow. It’s a situation that is getting more expensive and energy-intensive at a time when things need to be getting more cost-effective and sustainable. 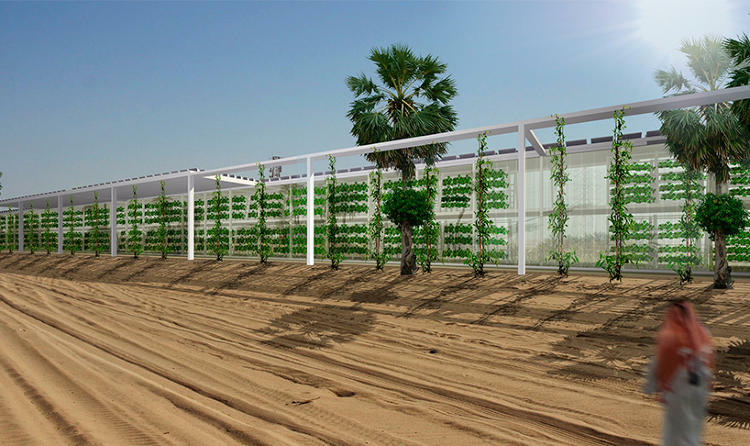 Luckily, a team of architects hopes to create a new agricultural system that could grow and deliver food in the desert. 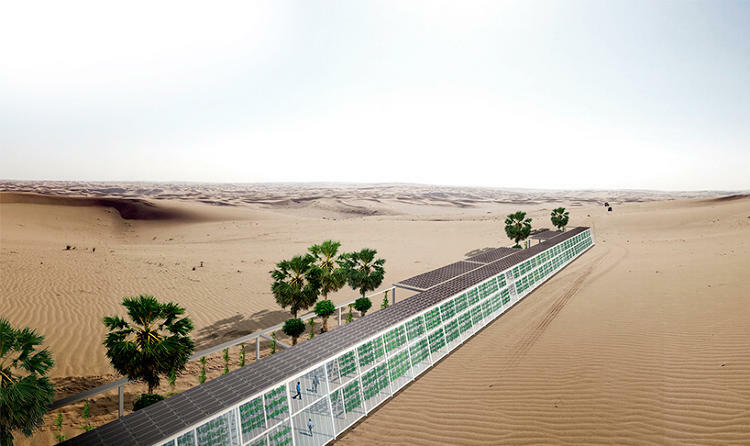 It’s called OAXIS, a conceptual design for a modular set of prefab greenhouses, covered in solar panels, which would extend from a city into the desert. 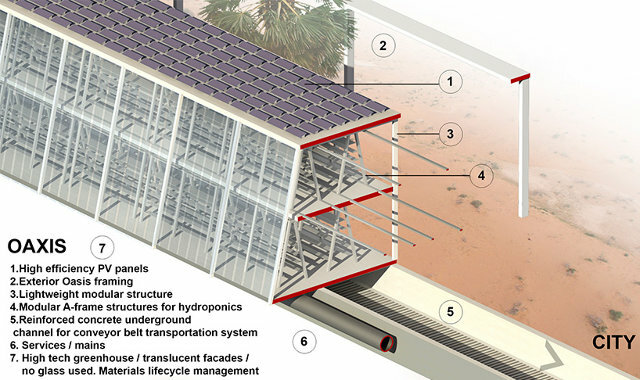 The design of the buildings aims to keep out intense summer heat while the solar panels would power the rest of the building’s infrastructure and send extra energy back into the city. Conceived by Forward Thinking Architecture, a Barcelona-based firm, the concept seeks to combine flexibility with a minimal carbon footprint. Towards this end, they chose to forgo usual transportation and create a unique conveyor system that would deliver produce without the use of any fossil fuels. The conveyor belt would be underground so it could keep running in a straight line even if buildings were in the way. Inside the prefab greenhouses, farmers would grow crops like tomatoes, lettuce, and strawberries using a hydroponic system that can reduce fertilizers and pesticides and save 80% of the water used in traditional agriculture, in part by recycling and reusing it. As for where the water comes from, the designers suggest that groundwater could supply the farm’s needs, but many Middle Eastern countries already rely on desalination. We thought it cannot only be a farming-only building, it must have a pedagogical approach and have to be attractive in order to become a biodiversity hub which can be visited by the local people and visitors… The cities should be smaller, denser, and compact, but this is not the current situation for some of the Arabian peninsula cities since they have exponentially grown and attract more people and workers. There has been a rapid urbanization in the area since the middle of the 20th century. The project, he hopes, could help supply food as climate change makes the situation even more challenging. Already, countries in the worst-affected regions are desperately looking for solutions. For example, Qatar has already invested hundreds of millions in a plan to grow as much local food as possible by 2030. Other countries in the region, like Kuwait, Dubai, Abu Dhabi, Jordan, and the desert-locked Saudi Arabia are expected to follow. These regions in particular have felt the pressure brought on by the escalating price of importing food. This pressure is exacerbated due to the disappearance of peak oil, which accounted for the vast majority of this region’s wealth. However, the project has farther-reaching implications, as Climate Change threatens to turn much of the world’s arable land into dry, drought-ridden plains. The OAXIS project is an alternative or complementary way to respond to the food insecurity and water scarcity of the region in a self-sufficient way. It aims to help reduce the food imports to feed part of the people in a nearby future based on renewable energies. Hmmm. Interesting project, but I do wonder about water coming from groundwater sources. I’m not sure they’ve thought through the sociological effects of this either – there is more to a community than food! Yes, but the concern is feeding the additional three billion that there may be 2050, especially when Climate Change will lead to increased drought and the destruction of arable land.